REINCARNATION is an interesting word. When talking about Nature, the phenomenon is rooted in the laws of the Universe, and thus may appear mundane. The word gets more attention when it relates to the transformation of the soul and the body itself, and more so when it talks about a man changing to something of an entirely different species, for instance a dog. 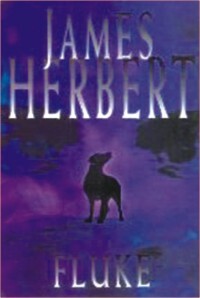 James Herbert, Britain's bestselling writer of chiller fiction delivers another mind-boggling tale superbly told through the eyes of a dog. Known for being the master of horror, with celebrated titles like 'The Fog' and 'The Dark', Herbert however does not exactly carve this one into his usual genre. If you're looking for the classic Herbert horror, this is not where you should be looking. What you get instead is an eloquently plotted book, light fantasy you might want to call it, but of course, not without a touch of darkness to go with it! The author digs into death and existence, stuff that never ceases to fascinate. This is Fluke's story. Fluke is of course no ordinary dog. Wandering hungry along dark alleys and dozing in broken-down church yards, Fluke has some unsettling thoughts that surface every now and then. A skeleton of a past life dances on the edge of his consciousness, memories that arise to haunt him but never does claw its way out from the murky depths of his mind. He knows he was something more. The memories are of what he had once beena man. Fluke knows he has to embark on a journey to find out the truth about himself. It sounds like a simple storyline, but the feelings that Fluke has of his milieu is insightful. There are scenes where Fluke, instead of trying to dig up antiquated feelings of his past, stops and thinks about what's happening around him: about the things he sees and smells, and feels, and the relationships he has encountered, both animal and people. These moments are the breakthroughs in the novel as the man-turned-dog starts to come to terms with who he is. Herbert captures the world as seen through a dog's eyes in such a compelling fashion that the reader would have to believe it to be the most accurate portrayal of canine thoughts and feelings. Some of the characters are very memorable, Rumbo being the show stealer. Rumbo is the junkyard dog who takes Fluke under his charge, enlightening him with all the tricks of a doggy-dog world. Their relationship lends the story its humorous and hearty moments. Packed with just the right balance of tension and excitement, it also comes with a moment or two of hilarity, one being when Fluke stands outside a church listening to the muted hymns, and joining in at the bits he knew. The early days into his adventure are never free from moments of Rumbo imparting wisdom. Fluke shares, “He taught me that life took advantage of the living, and to existreally to existyou had to take advantage of life. In his opinion dogs had let themselves become slaves to man”. The novel grips you with fine character constructions and a powerful plot. It spirals to a climax of suspense where some chilling surprises await. The author spins a sparklingly fresh take on life and its endless cycle. Finding acceptance in an absurd world is the main quest that Fluke chases after. Rich in content and character, it has a unique resonance, and of course, the bold perspective of being a dog. Sometimes sad but not depressingly so, and sometimes touching but not gushing, this is one book you will be keeping for a long time.